-- From the serpentine Champie of Lake Champlain to the venerable Nessie of Loch Ness, extraordinary - and unexplained creatures of the deep - have been reported in sightings throughout the twentieth century. Now, two of the world's leading cryptozoological investigators provide a globetrotting field guide to when, where, and what kind of mysterious aquatic beasts have gripped the public — and sometimes the scientific — imagination. Filled with comprehensive drawings, classifications, and maps, their book offers an invaluable and unusual resource for the intrepidly curious to investigate these sightings firsthand, or to simply enjoy the fascinating accounts that others have given. • Brent the Sea Serpent Glass Figurine -- Not only are they cute and collectible, but each one also has its own story-telling biography and birth date. 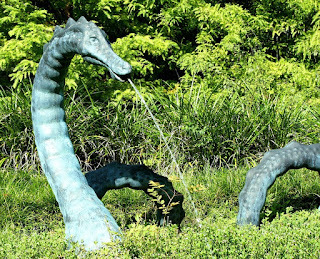 • Cecil The Sea Serpent Coil -- Measures over 15-feet in length. Brighten up the pool, lake or beach with brilliant color.